When a crystal's growth is interrupted, a thin dusting of minerals such as pyrite, hematite, chlorite or galena can gather on the termination faces. 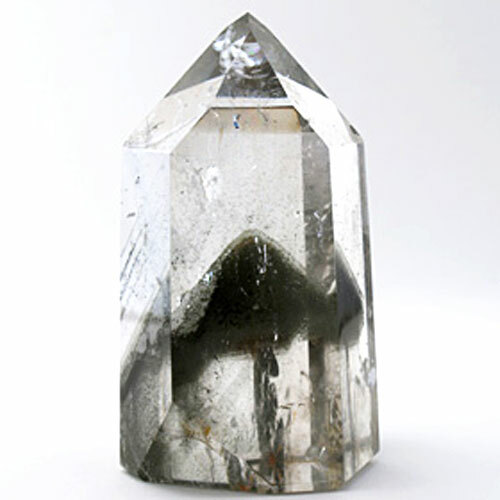 If growth resumes, over time the mineral dusting covering the crystal's original facets is incorporated into a larger quartz crystal structure, creating the classic phantom crystal outline which can be seen within a larger crystal. Phantoms help us unearth our own histories and come to terms with unresolved issues from our past. In this way, they help to restore a sense of inner balance, unity & wellness where there had been pain and struggle. Read more about Phantoms in our Crystalpedia.